Today at the Gym – older guy that is a new face to me. The rear half of his head that has hair is combed straight back, finishing up in a straggly party in the rear. His mustache is much more salt than pepper, so much so you can hardly see it. His exercise machine of choice is the Cybex tricep extension. 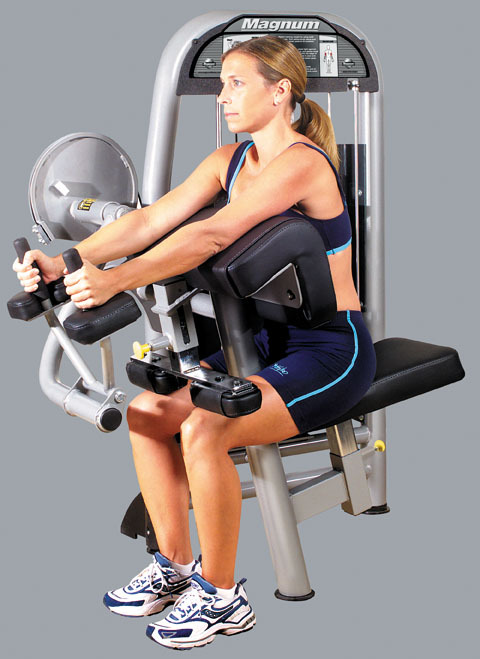 The image to the left depicts a woman using proper form on the machine. This man obviously never saw such a picture. His elbows were in a locked 30 degree position and no part of his arms ever touched the large pad. He simply lowered and raised his arms above the pad. At the high point of this movement his elbows hovered approximately 8 inches off the pad. At the bottom he got within 3 inches of contact. Perhaps I have it all wrong and this guy was intentionally using the machine as a bastardized stiff armed front lat pull down device. I doubt it however. I finally got around to adding +1 to my untimed Ray’s Way today. Two weeks ago the 15-10-20 sets were hard but more doable than I like. Adding a single rep may seem like no big deal and normally I would agree with you. However if I add 1 rep to all three RW movements it winds up being 15 extra reps overall because the circuit is gone through 5 times. It feels a lot more significant than it sounds. I got through the 5 sets of 16 dips, 11 pull ups and 21 push ups intact, even observing the HOH only(hands on hips) rest periods. It felt significantly more difficult, enough so that I can uncomfortably stay at this level for a few more sessions.